First things first: One of the best things about a cruise is that it offers an affordable vacation. Instead of forking over cash for transportation, hotel, meals, and entertainment, a cruise offers everything for one price that’s usually lower than you’d pay for everything if you were to book it separately. But don’t think that cruise lines make their vacations affordable out of the goodness of their hearts. Remember, cruising is a business. And for the cruise lines, there is still plenty of money to be made once passengers are on the ship. In fact, once you board, you’ll notice all the opportunities to spend money. From the ship’s casino (conveniently placed in the middle of the busiest part of the ship) to fancy shops, you’re never far from a place to drop some coin. 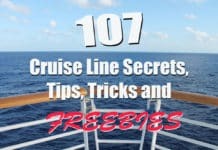 And with the opportunity to spend money means there is also opportunity to waste money — especially if you are a first-time cruiser who isn’t versed in what’s a good deal and what’s not. That’s why we’ve rounded up some of the biggest ways that cruise passengers waste money on their trip, whether it’s on the ship or off. If you’ve never been on a cruise, then you might be surprised when you first encounter the art auctions and sales on board the ship. They are ubiquitous across cruise lines. Let’s be clear. If there is a piece of art you like and you are fine with the price, then there’s no issue. However, there are a number of stories of buyer’s remorse when it comes to art auctions. You can read more about art auctions here and here. If you are driving to a port — and you intend on staying nearby the night before — then you should look for a hotel with a parking package. 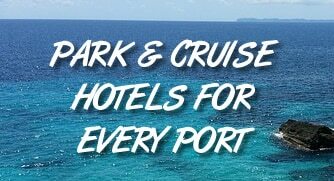 Parking packages include parking at a hotel for the length of your cruise in return for a night’s stay. If you plan on staying near the port anyway, it can save you a ton of money. Considering that some ports charge up to $20 (and sometimes more) per day, you can save $140 on parking fees just by staying at a hotel with a parking package. Click here to see a list of hotels with parking packages for every port in America. Over the past few years, cruise lines have started to introduce drink packages. These packages are essentially “all you can drink” for alcoholic beverages. You pay one daily cost and you can just hit the bar whenever you are thirsty. This way you don’t have to worry about the cost of each individual drink. Passengers that like to drink on their cruise can save considerable money by buying a package instead of paying for each drink individually. For instance, a package aboard Carnival costs about $60 per day, and individual beers are about $7. So if you plan to drink more than eight beers over the course of a day, then save money by getting the package. For more details and to see if it’s worth it for you, try our Drink Package Calculator. Wait, didn’t we just say people waste money by not buying a package? Some do, but for others it more of a waste to buy the drink package when they won’t take full advantage. When you purchase the package, you have to buy it for every day of the cruise. In addition, some cruise lines make every adult in a cabin buy the package if one person does (this is to discourage sharing). At $60-80 per day, a drink package is a big investment that you pay for, even on days when you are in port. If you aren’t going to use it to the full potential, then it can cost you significant money. There are plenty of opportunities to do shopping on the cruise ship, with everything from cheap trinkets to expensive watches all for sale. But you need to be careful. Unlike at home, you can’t easily hop online to price compare when you are in a shop aboard a ship in the middle of the sea. Instead, if there’s a souvenir you have your eye on, wait until it’s on sale on the ship. With only a limited amount of time passengers are on the ship, sales run often. It gives you a chance to pick up something cheaper than you would otherwise by being a little patient. If you drink wine or champagne, then don’t forget to bring a bottle of your favorite with you to boarding. To be sure, you’ll want to check your cruise line’s specific policy, but just about every line lets you bring on at least one bottle of wine or champagne per cabin. Considering that it’s common to pay $8-12 per glass once on board the ship, it’s a no-brainer that anyone who plans to drink wine and doesn’t bring their own bottle is wasting a ton of money. No one likes ATM fees, but sometimes they are simply the price you pay to have access to cash. On a cruise ship, that price can be borderline ridiculous. While you might pay $2-3 to access cash on land from an ATM, there are machines at sea that cost up to $6. In other words, be sure to bring enough cash for your trip. And if you run out? Well try to limit your run to the ATM to just once. Everyone forgets things, but on a cruise you should try your best to remember anything you might need. When you’re on a cruise in the middle of the sea, it’s not simple to just run out to the nearest store and pick up something you need. Instead, you’ll have to make due with what’s on the ship or what’s in port. That often means paying inflated prices for the things you need. To be certain, it’s not likely to break the bank, but it can be an annoyance. Instead, be sure to pack all of these useful items (which include more than a dozen you wouldn’t think about). Right as you get off the cruise ship, you’ll be greeted with shops, merchants, taxis and more. All of these people are there to cater to cruise passengers, but they also usually charge tourist prices. Instead, you can save some money by walking a little more and catching a cab — or visiting a shop — a little out of the way. It’s common in many ports to haggle for prices, so don’t be afraid to tell someone what you want to pay instead of what the listed price is. It can save you even more. If you want to visit the spa, then have at it. The cruise ship spas offer a variety of services and can really pamper you while on your vacation. However, if you just want a simple massage, then you can save a lot of money by waiting until you hit a port. In most ports, places on the beach will offer massages at cut-rate prices. To be sure, there is likely no licensing of these masseuses like there is on the cruise ship. And often the massage is given on a portable table at the beach, so the atmosphere isn’t as nice as the cruise ship spa. Still, at just pennies on the dollar, it can save a lot of money if you are only looking for a simple rub-down. Some people will tell you that any gambling is a waste of money. However, if it’s entertaining to you, then there is no problem tossing the dice or playing the slots. That said, you should realize that the payouts on cruise ship casinos can be pretty low. It’s common to find blackjack that pays 6-to-5 (instead of the traditional 3-to-2), as well as video poker machines with low payouts. In other words, play all you want, but know that the casino payouts aren’t in your favor.